Jakob Grimm (1785-1863) and Wilhelm Grimm (1786-1859) were two German professors working mostly in linguistics. They are best known, however, for their collection of folk tales and fairy tales. 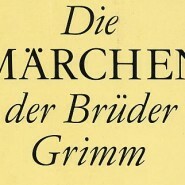 They collected German and French tales that were probably handed down orally for many generations, and published them. Es war einmal ein altes Schloß mitten in einem großen, dicken Wald, darinnen wohnte eine alte Frau ganz allein, das war eine Erzzauberin. Once Upon a Time… all the great ones begin that way, don’t they? Jorinde und Joringel indeed begins that way. The story has all the elements of a classic fairy tale (except the wicked stepmother that Grimm’s fairy tales are famous for). There is an enchanted castle, a witch that collects chaste maidens that she turns into birds (she has collected 7000 maidens-turned-into-birds, so the large, dense forest must have been densely populated), a spell that can be broken. Jorinde, the most beautiful of all chaste maidens, is caught, and Joringel, her boy-friend, sets out to find a way to break the spell. He succeeds, of course, and releases Jorinde and the 7000 chaste maidens. And Jorinde and Joringel lived happily ever after. Jorinde und Joringel was read as part of the 2007 Once upon a time challenge. Listen to Jorinde und Joringel at Märchenwald (in German). What a neat selection. So many of the Grimm fairy tales are famous, but I’d never heard of this one. Great find on the MP3 too!